To speak with owner please call 315-685-6279. This quaint, pet friendly (with owner permission) cottage is one mile from center of Skaneateles village-easy walking distance. It's located on a private lane approximately 400 feet from Skaneateles Lake-no roads to cross. The cottage is surrounded by trees and very private. The cottage, while a 2 minute stroll down the private lane to the lake, includes a separate, private porch (rustic red building shown in photo) right on the lake-great for cocktails, sunsets, cooking out ,etc. The lake front is level, has its own dock, and and has a gradual slope-great for swimming for all ages. The lane is tree lined-very private. The cottage is heated, has a fire place. The cottage can accomodate a family of 4 -6 people, and has wi-fi. My family has lived in Skaneateles for 6 generations. This property is owned by 3 siblings, 2 public school teachers and one accomplished musician, each still living in Skaneateles. This property is a great choice if you're interested in a private setting, prime lake front access, all located one mile from the center of the village. East side of the lake, afternoon sun. This cottage does have wi-fi . We stayed in early December and the cottage was perfect for us, specially the fact that it was pet friendly so we could bring our lab. It is a great location, just a short walk down to the lake and also very close to the village. Bed is very comfortable and cabin has all the amenities you would expect. We happened to meet one of the cottage owners at Rosalia’s who gave us some great tips on food! We enjoyed coming this time of year as it is quiet, yet many activities are on going. All the local folks were super friendly. We visited many wineries and breweries that allow pets. As YMCA members we took advantage of the nationwide reciprocity and used the the Skaneateles Y which has awesome skating rinks. If you are new to the area (as we were) check out the recently opened visitors center in Auburn which provides lots of information. All in all a great time and we will back at this cottage in the spring! Thanks Kim for your review. This traveling couple and pet were the perfect guests! We normally close the cottage for the winter months after Thanksgiving. After communicating with Kim, I was convinced that they could handle the cottage in December. I'm so glad they came. My sister met them and instantly texted me to tell me that they seemed like a fun couple. And thank you Kim for taking such good care of the cottage, and leaving it so clean. Hopefully we'll see you again. I stayed here on my own for Thanksgiving weekend, so not sure how relevant my review will be for others. But it suited my needs perfectly. Very hard to find a small affordable rental on any of the Finger Lakes. Cozy, clean. Loved the fireplace, particularly at this time of year. Only a mile walk to town, so I hardly needed my car at all once I got settled in. Heater is a bit noisy, but not a big deal. Overall, very satisfied, would do it again. Stephen was the perfect guest. It was a chilly weekend. My father built that fireplace 65 years ago for my grandmother's she cave. Thanks for staying with us, and thank you for your review. We enjoyed our stay at this cute and cozy cottage. It was only a mile away from the center of town. Set in the woods, it felt very peaceful. Everything you could need was provided. The WiFi worked great and there were plenty of channels to watch on TV. There was also a second TV in the bedroom. The bedroom area and bathroom were decorated very cute and the beds were comfortable. It was a wonderful Fall weekend and we enjoyed our stay very much. Thank you Dawn for your kind review. Sorry we missed you. We were out of town. Moreover, we really appreciate how clean you left the cottage. Hopefully we'll see you and your family in the future. Cottage is exactly like description. Everything we needed, the modern conveniences of a kitchen, bathroom and bed and a beautiful yard, the lake is a short walk away pack some drinks and towels and spend some time at the private beach. Very quiet yet close to town. Our stay was May 18, 2018. The directions were very clear and the cottage was easy to find. It is nestled in the trees down a lane heading to the lake. The cottage was very clean. Andy provided clear instructions for the cottage, including wifi/local attractions/check-out procedures. Despite the rainy and cool weather, we enjoyed sitting on the porch and drinking coffee. Ample linens were provided and the beds were comfortable. When traveling to Skaneateles again, I would book this cottage again. 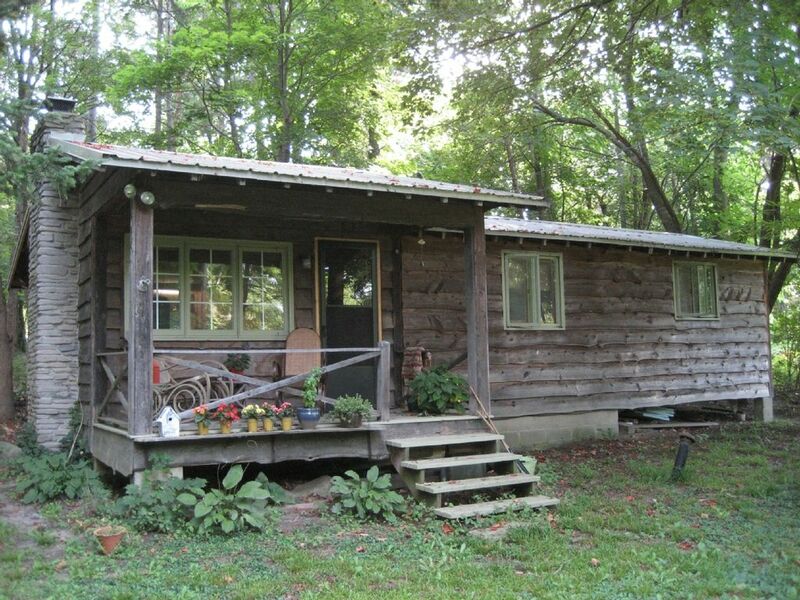 It is a gem in the woods with a good amount of privacy. Nice fun couple that took special care of our cabin. Hope to see them again when they can enjoy sunny skies.